Sakura Watch, May 2, 2015 - first opened blossoms spotted in High Park today signalling the official beginning of the sakura // cherry blossom season! The sunny and warm weather has pushed up the schedule a few days for the trees as there were approximately a 1-2 dozen blossoms that were open during my visit to the park today. As previously mentioned, the trees near the sports fields have the most significant number as they are also usually the first to bloom. The grove of trees along the big hill and winding path was overall a mixed collection of florets in various stages of development, some seem to be ready to open within a few days, others still may need the rest of the week. How to tell which trees are going to bloom first? more bees and other insects will be flying near the tree indicated they can sense the pollen from the flowers. If you see the florets are only partially extended, in groups of 3-4 bundles or still in deeper shades of pink, they signify the blossoms are still a few days away or longer from opening. The shorter the floret stem and the dark the pink colour, the longer the time they will require to open. 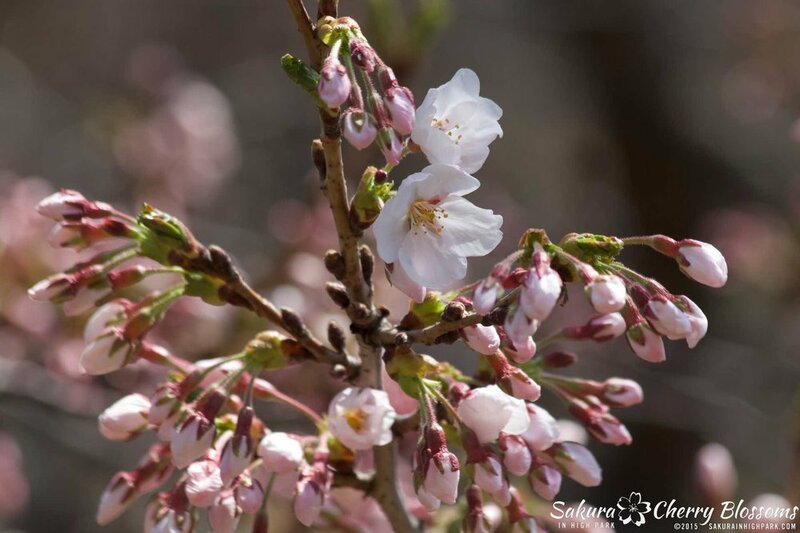 The photos shot today better demonstrate what to look for during your next visit to the sakura. So now that we see the first blossoms have opened, I can now safely say that the official prediction will be moved up for the full bloom to happen between May 5-10, 2015 - which still leaves plenty of blossom viewing in time for Mother's Day this year! I hope you enjoy the photos taken today and have a fantastic weekend! Watch for my next update, with more blossom photos by this Tuesday.